So I'll be the first to admit that sometimes I make snap judgements with little to no proof behind them. And once I make up my mind about something I'm stubborn enough that it's very difficult to sway me. However there's also this really weird and inexplicable phenomenon that happens to me where I'll decide I passionately dislike something, only to ultimately end up loving it more than anything else ever once I give in and try it. It's happened with bands, movies, food, people, all sorts of things. Still following? Well, the reason I'm talking about this now is because the most recent victim to this yo-yo attraction is the OPI Color Paints. I irrationally disliked them at first (So much hype! Just for a line of jelly polishes! What!) only to end up purchasing the ENTIRE collection once I came across it, and now that I've tried them I can't imagine not having them in my life. Like... You need to run out and get them right now. The hype is real! Check under the cut for a better look at how amazing these are and for more of my ramble-y (yet passionate!) thoughts about them! So I'm in the process of swatching the entire OPI Color Paints Collection right now but before I started I decided to try playing around with them for a bit to get my energy up. This is the second time I've used them - the first was on a friend and I used too dark a mixture of shades and it just didn't work out. But this look I like! It reminds me of a sunset! I started with the base you're intended to use - a full-coverage silver metallic called Silver Canvas. I'll have more thoughts on the base/layer process in my full swatch post later this week. Then I freehand layered a quick and slightly smooshed ikat gradient using Primarily Yellow, Pen & Pink, Purple Perspective and Turquoise Aesthetic. The whole thing is sealed with a layer of top coat. I did a few strokes of each colour to get this look, though you really have a lot of opportunities to layer colours in different ways if you want. There was naturally a more orange layer between the pink and yellow but I decided I wanted the pink to really pop so I layered a few coats where it overlapped the yellow to remove most of the orange. 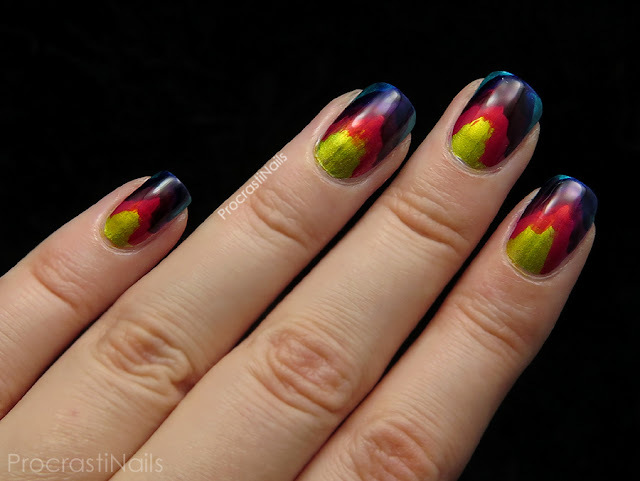 This quick and fun design was definitely enough to get my polish spirit in gear so I'm actually typing this post up while taking a break from swatching the collection right now! 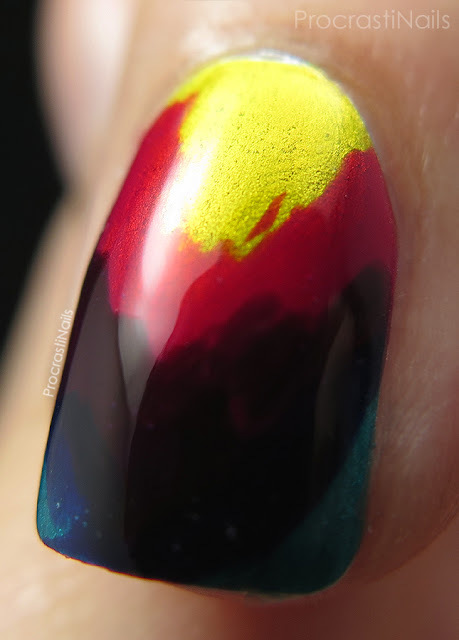 I think this preview gives you a good idea of what you can do with these polishes (imagine the leadlighting!) and I really look forward to sharing the full swatches and more art with you. 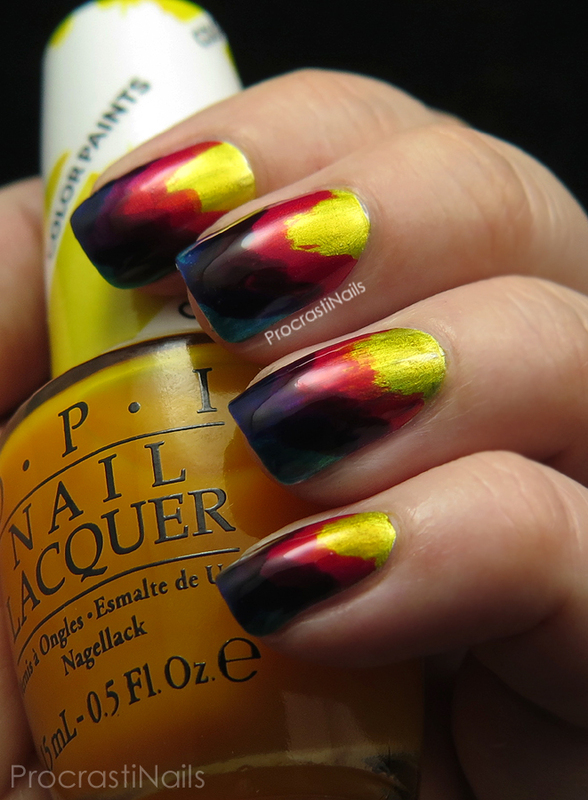 Have you picked up any OPI Color Paints yet? Have you given them a try? I'd love to hear what you think! Very cool take on Ikat! My thoughts pretty mirrored yours, "it's just jelly polish, how is this new and/or exciting"... looking forward to reading your full review and possibly having my mind changed lol! My thoughts were the same! Maybe I need to check them out as well! Nice mani!! I love this! It looks like a really awesome tie dye design. I really want to play with these. I'm having so many similar feelings about this collection! I should probably just give in and buy them all now haha. I really like this look! I adore this look! The more I see the Color Paints being used, the more I want them all. haha! Ooh that's cool! Especially the yellow is so bright and cheery looking. Haha, fortunately I have yet to buy a collection I first said I disliked! It's good to change our minds every now and then I guess! This looks so cool and interesting, I love it. I have not tried any of the color paints yet but this is definitely making me want to. 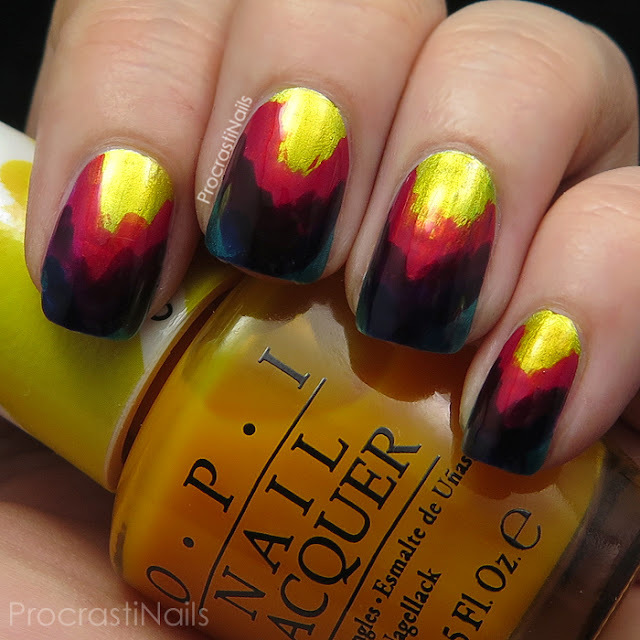 This is such an awesome way to use these polishes! I definitely have them on my "to get" list! I just ordered the mini set today and your post makes me glad I did!